In a major jolt to the Congress, the Election Commission tonight issued a show-cause notice to the party president, Ms Sonia Gandhi, and the Chhattisgarh Chief Minister, Mr Ajit Jogi, for violating the model code of conduct. Would you support the privatisation of HPCL-BPCL? Prime Minister Atal Bihari Vajpayee today launched the BJP’s campaign for December 1 assembly elections in four states, asking Chhattisgarh Chief Minister Ajit Jogi to step down like BJP state leader Dilip Singh Judeo and told the Congress there could be no double standards in dealing with corruption in public life. 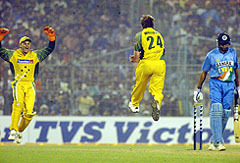 Australia’s Brad Williams (C) jumps to celebrate the dismissal of Indian batsman VVS Laxman with wicketkeeper Adam Gilchrist (L) during the final match of the tri-series in Kolkata on Tuesday. India lost the match by 37 runs. All parties want video camera as election symbol. The Uttar Pradesh Government today filed a fresh affidavit in the Supreme Court amending its stand taken in a petition challenging the filing of a supplementary chargesheet by CBI dropping conspiracy charges against top BJP leaders in the Ayodhya demolition case. In a major jolt to Tamil Nadu Chief Minister J. Jayalalithaa, the Supreme Court today ordered trial against her in a special court at Bangalore in two corruption cases pertaining to alleged acquiring of assets worth Rs 66.65 crore by her. A day after Prime Minister Atal Bihari Vajpayee ordered a probe into the Judeo videotape controversy, the CBI registered a preliminary enquiry today after it received a note from the Cabinet Secretariat. A CRPF jawan was killed and two others injured in a suicide attack here this evening by militants on a CRPF camp at Indira Nagar, near the BB Cantonment, where the strategic 15 Corps of the Army is located. The 300-km Jammu-Srinagar national highway has been closed since last night due to landslides following snowfall and heavy rains in the state, official sources said here today. Pakistan today charged India with using “pressure tactics” by delaying confirmation of Prime Minister Atal Bihari Vajpayee’s participation in the SAARC summit here in January next year in order to force Islamabad to restore airlinks prior to his visit.